Stadium Financing 100% Publicly Financed. The stadium was originally built in 1938 on land deeded to the City for the purpose of constructing public sports fields by Mackenzie King (a personal friend of then Mayor Clarke). The original Clarke Stadium accommodated approximately 20,000 fans in the spartan conditions consistent with its era. The seating area consisted of two grandstands on opposing sidelines (no "endzone" stands originally, but these were added in later years). The stadium hosted the Edmonton Eskimos of the Canadian Football League in 1938 and 1939 before going bankrupt.� They begun again in 1949 wearing the now iconic Green and Gold uniforms, and were again in Clarke Stadium until 1978. The team moved to Commonwealth Stadium, which had been built adjacent to Clarke Stadium in preparation for the 1978 Commonwealth Games. 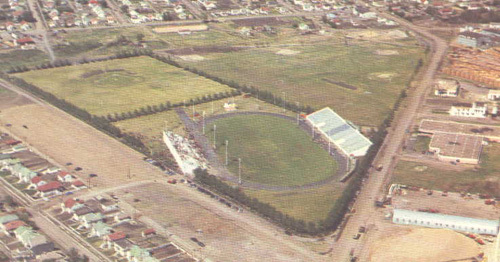 Clarke stadium was used for local and minor league sporting events after the departure of the Eskimos. The stadium was named after former Edmonton mayor Joseph Andrew Clarke. The stadium was effectively demolished on May 3, 2000.